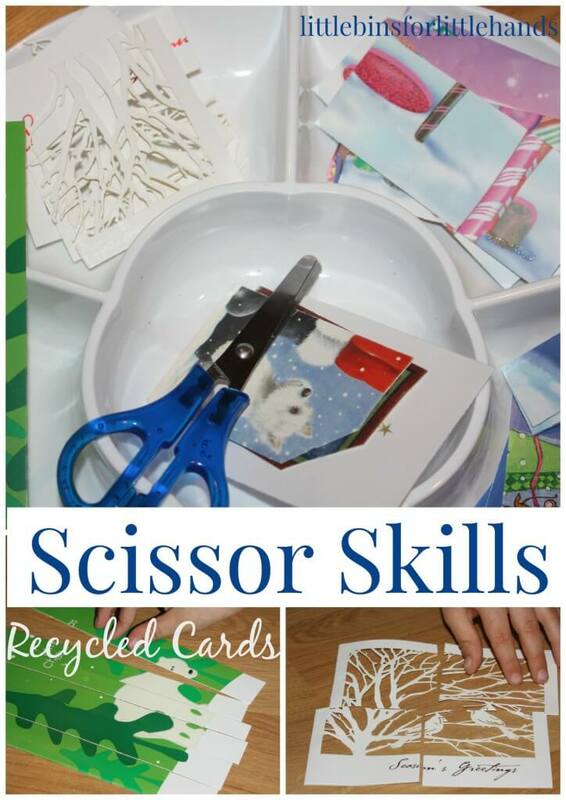 Quick and easy Christmas Fine Motor Skills set up with recycled cards! This is so SIMPLE. All you need is a handful of old holiday cards (or any cards!) and a pair of scissors. We love fun cutting skills trays with new materials. Looking through stacks of cards, I thought they would be great for something. Home made puzzles! I precut the puzzles with different piece sizes and shapes and amounts. A more advanced child can cut his own puzzles. I made one for each part of the tray! He loves his tray and being able to pick which one he wants to do next. In the center, I placed some gift bag tags and a pair of scissors for him to make his own puzzles. (Great for multiple ages and skills!) I love finding ways to use what we have! This was our first Christmas fine motor skills tray and it was so fun and easy! He practiced cutting them into four pieces each and putting them back together. This is a unique way to work on puzzle skills for Liam because he doesn’t generally enjoy boxed puzzles! Liam does a great job cutting when I encourage him to slow down and and make complete cuts! Time for Fine Motor Fridays! 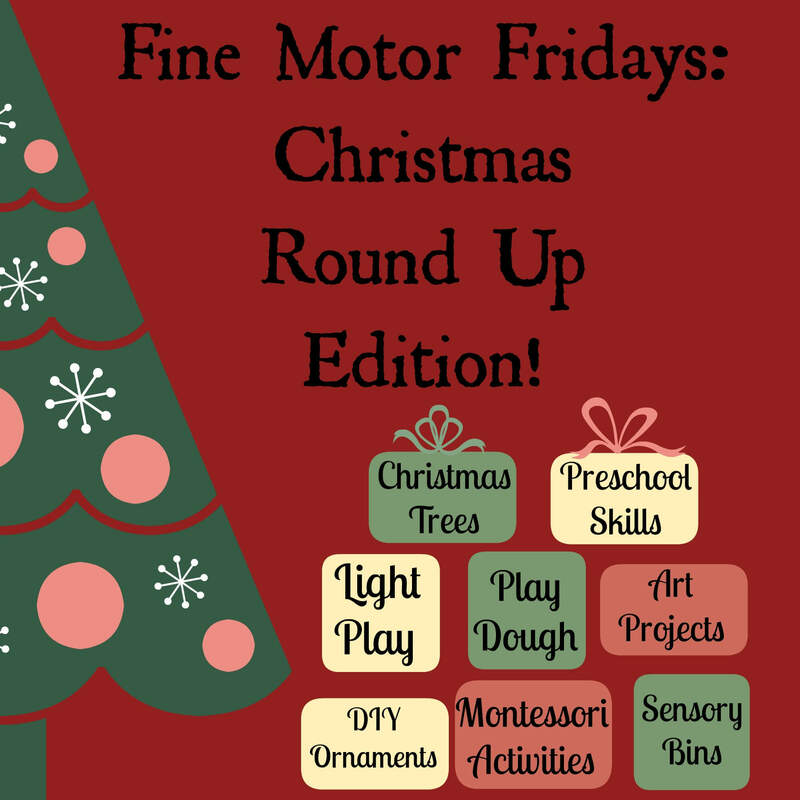 Please check out these other fabulous bloggers and wonderful fine motor skills round ups! Thanks for including 3 Dinosaurs! Ooooh we love puzzles at our house – we’ll definitely be doing this! Using old cards is a great idea! I’m sure we have a stash somewhere! I just bought a new tray, too- love your ideas! Awesome activity and super round up! Soo many ideas that my daughter will LOVE! The card puzzles….so genius. I love that sewing tree too. Thanks for putting together such a fun list of activities!! Thanks for putting the whole thing together Laura. We had fun with this! I love how you reused the Christmas cards (and threw in some fine motor practice too!). I always hate just tossing them in the recycling bin! Good idea! Use what you got is my motto these days! ooh! I see some fun activities! Thanks for sharing! So many great ideas shared, but I love how you reused the Christmas cards. I hate throwing them out too, by the way. I also love how you managed to turn it into a puzzle without it seeming too much like a puzzle for Liam. Thanks Dyan, we are so sneaky around here! Love using old Christmas cards like this! Going to try it with my little guy this week. PInned! So easy, budget friendly, and recyclable too!